It’s a practice that’s been around for years – undercooked steaks. But now there’s is a new trend emerging: undercooked burgers. So what’s the advice? Is undercooked meat safe? All raw meat contains bacteria. The types and amounts vary between different meats, and factors like farm hygiene and how they are reared and slaughtered do play a part. Steaks are whole cuts of meat, that means other than being sliced, they haven’t been processed in any other way. 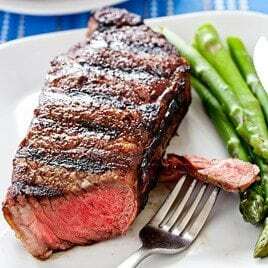 Most of the bacteria on meat is found on the outside surface, so if steaks are sealed correctly (all outside surfaces heated above 70oC), then the majority are killed off. This means that having steaks pink in the middle are thought to be safe to eat. Cross contamination means transferring bacteria from a-b-c. This can be done through contaminated chopping boards, knives, dishcloths or unwashed hands. Use separate chopping boards – one for raw (red) and one for cooked (yellow). Wash your hands with clean water and antibacterial handwash. If it’s not possible to wash your hands correctly, have one person handling the raw meat and someone else handling the cooked. KEY POINT: bacteria can be re-introduced to cooked meats via cross contamination bad practices. So what about mince then? Mince is a processed meat product, meaning the meat has been chopped and mixed. This means that any bacteria on the outside of the meat is now mixed throughout the mince. You should ensure all minced products are cooked thoroughly in the middle, so the juices run clean and no pink meat is showing. This means a core cooking temperature >75oC. This is the minimum temperature required to kill bacteria. This should be monitored with a food temperature probe and recorded as part of your due diligence. If mince is left pink, it means the core temperature is not hot enough and some bacteria can remain posing a food safety risk. What is more, some types of bacteria can produce spores which are much harder to eliminate; temperatures >121oC are required to kill these and any toxins produced by the bacteria. Which meats can be served pink? The Food Standard Agency advises against the practice of pink burgers but has published some guidance on it here. This entry was tagged catering, cooking, food legislation, food safety, training. Bookmark the permalink.